A perfect week describes a person's ideal week, which is both practical and possible within resources (e.g. Individual Service Fund or budget). It is a detailed description of how a person wants to live, not an unrealistic dream. It includes the important places, interests and people that matter to a person. The perfect week can become the basis of a personalised rota, and you can use the matching support process to think with the person about who they want to support them for each element of their perfect week. Using the perfect week tool helps people to think about what they would like their life to look like, and can form the basis of an effective person-centred care and support plan. It can also be used as an integral part of the Just Enough Support process, to make sure that people are using paid support in the most effective way. 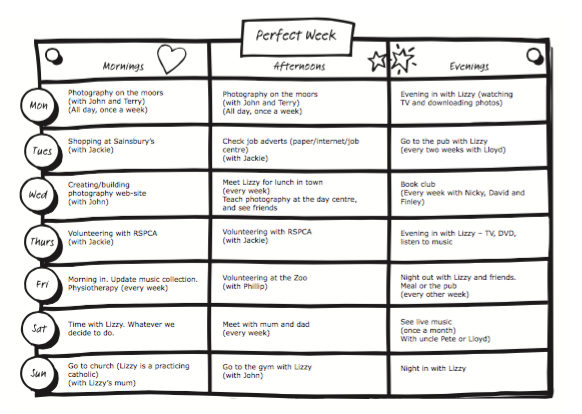 You can download a perfect week template here.